The center of Renaissance culture, Florence is a delight to the senses. 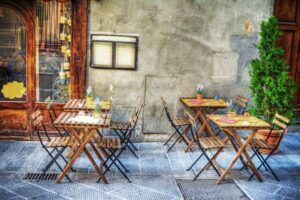 From the architecture, reminiscent of a golden age of art and cultural aesthetic, to the mouth-watering Italian cuisine sought after by most of the world’s population; there is never a question of whether the traveler should come here. The only question to be asked is, ‘What would that traveler enjoy the most?’ That’s where Homeric Tours comes in. Known as the ‘Cradle of the Renaissance’, Florence seems to have masterpieces on every corner. The Piazza del Duomo is a shining example of a monument that must be seen. This cathedral complex was built in 1436 and features an outside of marble panels of green and pink, with a marvelous dome that can been as an iconic image throughout the city. The inside is a stunning affair of high arches leading into vaulted ceilings that create a majestic atmosphere. Add in the Renaissance-style art adorning the walls and the interior of the dome—and you’ve got a sight the traveler will not soon forget. The Uffizi Gallery, constructed between 1560 and 1580, is famous for its selection of great works of art. The works of art range from the Middle Ages to the Modern period. The Renaissance-era paintings include masterpieces from Leonardo, Michelangelo, Beato Angelico, Giotto, Botticelli, and Raffaello. Roman copies of Greek sculptures line the halls, loaned or given from the prominent Medici family. The paintings and sculptures contained within cover two full floors of this large building, and will astound the traveler with a sense of awe and history as they peruse the Uffizi. Of course, no trip to Florence is complete without tasting the local Tuscan delights. This simple and flavorful culinary style is known throughout the world. Fresh, local produce and prime cuts of meat are the key ingredients in this masterful use of simplicity. Florentine Steak, a large t-bone cut with a hefty weight, awaits the senses. A tasty appetizer of Antipasto Toscano; fresh-baked and toasted bread with a helping of local sauce, meat, and veggies; is a great start to every meal. And, readily available in all over the city, a spectrum of pastas that will make the belly happy. When the traveler tops of a Florentine meal with Florence’s world-renowned gelato, the memories of their adventure in Italy will be complete. Regardless of season or tastes when taking in Florence, this city is a must-see for any traveler. When they walk the cobblestone streets, the narrowness bringing them closer to the architecture, their cares slip away into the past as they pass iconic and stunning sites. To be immersed in Florence is to be surrounded by beauty at every turn. What would the traveler enjoy the most about Florence—everything. In this package you will explore the treasures of the Vatican, including St. Peter’s Basilica, Sistine Chapel and St. Peter’s Square. You can explore on your own and visit the Colosseum and Forum Romanum or take a day trip to Naples and Pompeii to taste wine in the nearby wineries or take a pasta cooking class. 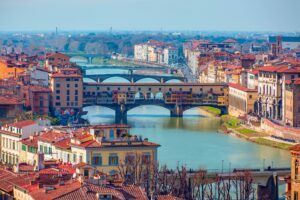 You will be transferred by train to Florence where you will experience a walking tour of the city which is called the “cradle of Renaissance” with a visit to the famous Duomo. Indulge yourself on your free days to explore this fascinating city by visiting the Accademia, home of the fabulous David, or take a journey to the Tuscany region. In this package you will visit Rome and explore the treasures of the Vatican, including St. Peter’s Basilica, Sistine Chapel and St. Peter’s Square, then on to Florence where you will experience a walking tour of a city called the “cradle of Renaissance” and a visit to the famous Duomo and walk along the Ponte Vecchio. You will take a train ride north to the city by the Grand Canal Venice where you will have a walking tour revealing the history and architecture of the city, where you will visit San Marco’s square and the Bridge of Sighs. You can explore on your won by taking a gondola ride on the Grand Canal or visit the islands of the Venetian lagoon. Discover Italy and its medieval town of Assisi. Tour the Bascilica of San Francesco to view masterpieces by Giotto and Cimabue. Immerse yourself in Gothic architecture in Siena, built on the three hills in the heart of Tuscany. 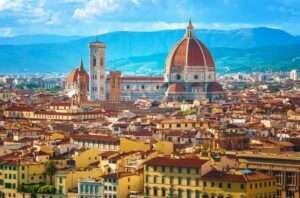 On to Florence the cradle of the Renaissance to the Cathedral of Santa Maria Del Fiore and Brunelleschi’s Dome, the Piazza Della Signora and the famous Palazzo Vecchio. Next stop Bologna, famous for elegant arcades and the King Rezo Palace, Podesta Palace and the Basilica of San Petronio. Experience the romance of Venice including St. Marks Square and Doge’s Palace. Tour the alluring Tuscany region, famous for the medieval town of Montepulciano’s wine and jazz. Explore Rome, where ancient and modern worlds collide while you tour St Peter’s Basilica, St Peter’s Square, Navona and the Pantheon and make a wish at the Trevi Fountain. Tunisia is the northernmost point of Africa. Steeped in ancient culture and architecture, Tunisia is vastly different from Western countries. With a Mediterranean climate in the north, and semi-arid and desert climates to the south, Tunisia has a varied amount of ancient richness to please the traveler.